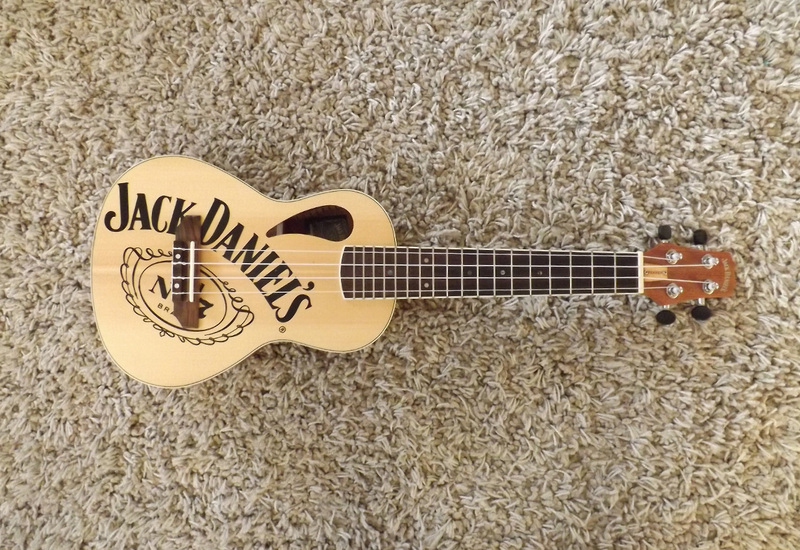 The Peavey Jack Daniels ukulele is the first ukulele I ever owned so I guess I’ll always be a little biased, it’s still a ukulele that I play a lot today. Here’s my honest thoughts on it having owned one for a few years now. When I first bought this ukulele I wasn’t even aware it was a Peavey instrument. I got talking to the owner of my local guitar shop and I asked him what you have to spend to get a decent ukulele without going too crazy and it was the one he recommended to me. He played a few little things on it and I liked the sound – also the fact that he had more expensive ukuleles but didn’t steer me in their direction told me that he was probably telling the truth. It wasn’t even like I could try it in the shop as I didn’t know a single chord at the time. I should point out that this is a concert-sized uke. At the time of purchase I wasn’t even aware that different sizes existed (it’s fair to say that I didn’t do my research), I just knew it was small and had 4 strings. In terms of the sizing, I find it pretty comfortable, more so than a soprano but that’s very much a personal preference. I think I paid around £55 ($85) for it and so far it’s been pretty good value for me. I know that ukes are notorious for not staying in tune but this one seems to hold out quite well. I do pretty much keep a Fender clip on tuner attached to it at all times should it go out of tune though. 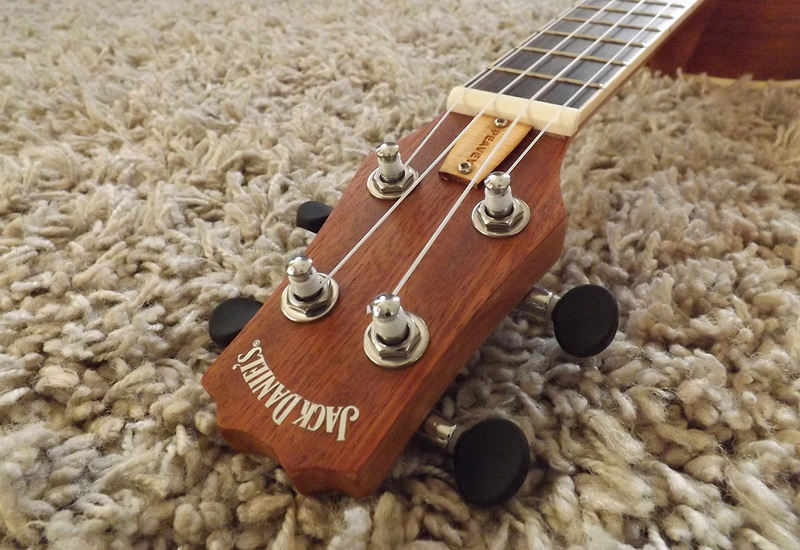 The ukulele itself has 2 sound holes, a small one on the front and then one on top which allows you to hear what you’re playing a little bit better. This does make it a little quieter when you’re recording though but it hasn’t really been a problem for me. The uke came with Aquila strings which have a pretty good reputation and are often the first name that you hear when uke strings are recommended. If I had to give one criticism of this uke, it’s the the neck/headstock seem very heavy in comparison to the body, there’s a little bit of an imbalance and it can make it a little awkward to play if you’re standing up and trying to hold the uke. The fingerboard and bridge are both rosewood, the back, sides and neck are sapele. Overall it’s a pretty decent looking uke that gets a fair bit of attention when people see it. 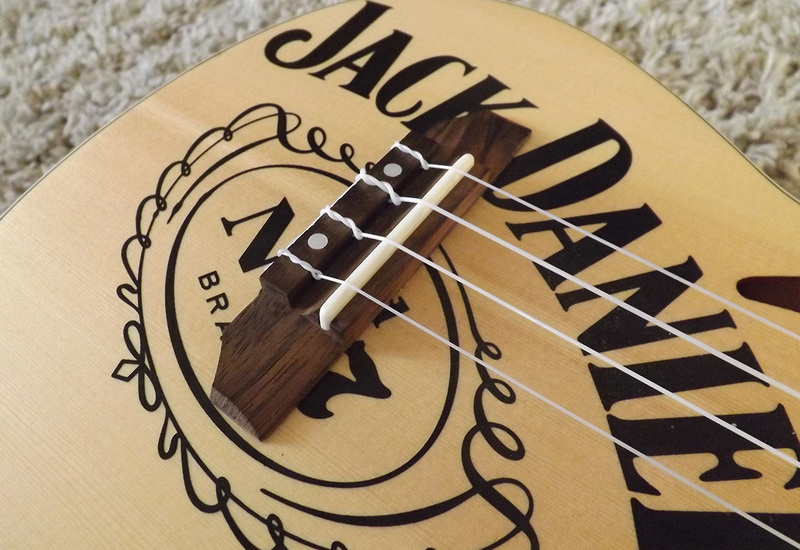 I’m really not sure whether the double sound hole makes a huge difference, it’s probably more of a style thing. The finish on the whole is pretty impressive, everything has a nice feel to it and it’s really tidy inside which I guess it has to be when it has a gaping hole on the side. It holds it’s tuning incredibly well and the tuners feel very smooth. Overall I think the finish on this uke is pretty good. Generally, I think the sound is pleasant enough – with laminate ukes there’s a tendency to sound a bit tinny which this uke doesn’t at all, I think this is due in part to the double sound hole. There is a little bit of a muddy sound when you’re playing chords, the notes can kind of blur into each other and you don’t really hear them on an individual level. This is only really noticeable when you’re embellishing chords and some of the clarity you might expect to get is lost. 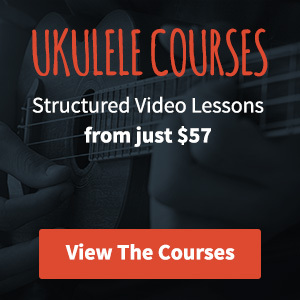 This isn’t going to be a problem for beginners as it’s only something you would really notice by playing a lot of ukuleles. All in all this has been really good value for me, I still play this ukulele a lot and I would recommend it to anyone looking to get into playing the ukulele. For anyone interested I took some close-up photos. Grab my free Ukulele Go! beginners pack featuring tips, chords, worksheets and more! I currently own this Uke and this is a great accurate review. I donated my first Uke immediately after trying my sons, and bought this one. Very happy with the sound, ease of play, though still undecided about the JD logo. Peavey sell an unbranded one if it bothers you that much. I suppose it sets it apart from other Ukes. A recommended buy in my opinion. Thanks Steve, this is pretty much my go to ukulele these days. It’s not perfect but it’s good enough for the price. I’ve seen the version without the peavey logo on and it looks a little odd, I think the offset sound hole unbalances it.